Intratrek Zimbabwe (Pvt) Ltd managing director Wicknell Chivayo has approached the High Court, seeking an order to compel the Zimbabwe Power Company (ZPC) to honour his contract for the construction of the Gwanda Solar Project, pending the power utility’s appeal at the Supreme Court. Chivayo’s application follows a recent court ruling which absolved him of any criminal misconduct in the advancement of $5 million to his company for the 100MW project. 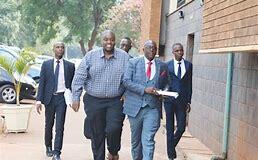 “This is an application for leave to execute, pending appeal, the judgment ad factum praestandum of the High Court per (Tawanda) Chitapi J rendered on December 13, 2018 as judgment number HH-818-18,” Chivayo said through his lawyers Manase and Manase Legal Practitioners. Sometime last year, Chivayo was arrested for allegedly duping ZPC in a solar power project signed between the parties in 2015. Later, ZPC approached the court and sought cancellation of the agreement, which was dismissed by Justice Chitapi, saying the contract between the parties was still valid and binding. “It follows that in the circumstances of this case there was no breach by the applicant (Chivayo) based on failure to timeously perform on time. Following the amendment of the contract there was no legal basis for the respondent (ZPC) to allege a failure to perform and to file criminal charges against the applicant. The involvement of the State organ, the police, in the contractual dispute in circumstances where the contract was clear on dispute resolution mechanism of arbitration and adjudication and before the mechanisms therein had been exhausted, was unfortunate and precipitate,” Justice Chitapi ruled. “It be and is hereby declared that the procurement contract No ZPC 304/2015 dated October 23, 2015 between the applicant (Chivayo) and the respondent (ZPC) is valid and binding between the parties. The judge also gave the parties a 60-day ultimatum to resolve the issue of discharging their obligations in terms of the contract.